/ Auch wenn wir hier tolle Pulverschwünge ins Gelände zeichnen, so ist diese Tour auf den Granatenkogel 3318m eine eindeutige Frühjahrstour bei nur sehr gut gesetzten Schneeverhältnissen. / Die Geländeneigung ist auf 30° angestiegen, womit der weitere Anstieg nun mit zahlreichen Spitzkehren fortgesetzt wird. / Blick in den bei sehr sicheren Lawinenverhältnissen befahrbaren nördlich exponierten, direkten Gipfelhang. / Kurzzeitig mussten wir die Skier schultern. Je nach Schneeverhältnissen kann man hier aber auch mit angeschnallten Skieren den Aufstieg fortsetzen. 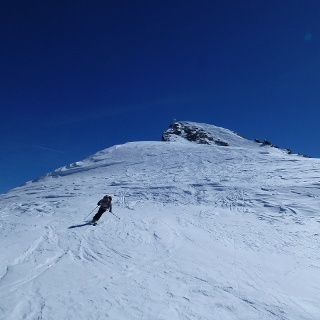 A massive ski mountain with a great steep descent. 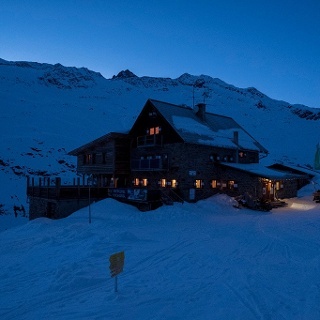 The Granatenkogel 3304m is one of the most challenging ski tours in the ski region Obergurgl. The inclination is up to 40 °. The descent over the Ferwallferner and subsequently through the Ferwalltal remains a never-ending moment of swing. From the valley station of the Festkogelbahn you can get to the Ferwall Valley via the ski slopes. In the valley of the river Ferhal, one should keep as far as possible in the region of the valley floor and rise with a scarcely significant gain in altitude towards the south. The mighty summit of the Granatenkogel 3304m is soon being built before us. 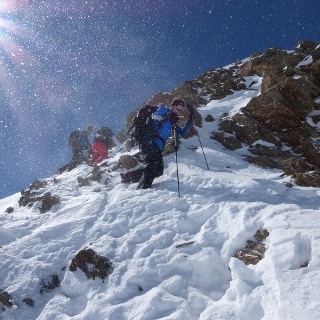 Ascent and descent routes can already be studied well and give the impression that you should be here only with absolutely safe avalanche conditions. Via the Ferwallferner one rises in increasing steepness in many peaks to the upper glacier basin, where one stops in the direction of Einsattelung at the beginning of the NW ridge. The inclination here rises above 40 °. In good snow conditions you can ascend to peak levels. However, in unfavorable conditions, ice axs or crampons could perform well. However, on this north-flanked flank without sunshine, the snow does not change so quickly into a hard melt resin cap. The situation is different in the area of ​​the NW ridge. 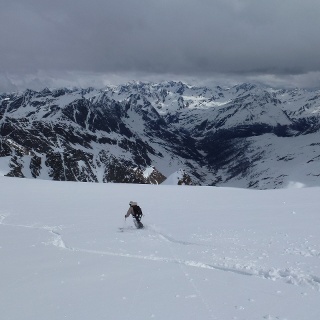 There is with a sufficient snowboard a ascent with skinned skis, but also a departure well possible. However, one must be aware that here the NW ridge falls with more than 40 ° steepness over 500 heights into the Gaisbergtal. As a result of skiing, one must be on the way to the ascent, or the snow conditions have to be favorable. In contrast to the northern slopes in the region of Ferwallfern, these westward exposed snow slopes can already be transformed into hard meltwater in spring and represent a corresponding hazard potential. 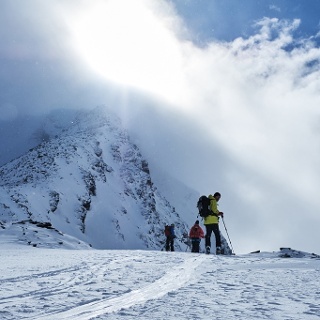 Many touring enthusiasts are already setting up their ski depot at the saddle and are consciously continuing the summit ascent on foot. 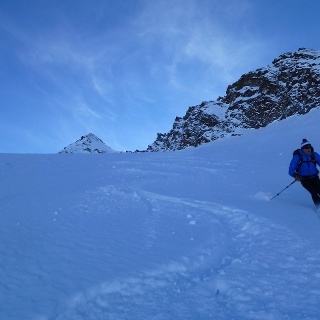 The ascent with skis is especially worthwhile if a descent over the direct summit on the northern flank seems possible. This is the real highlight of this tour. 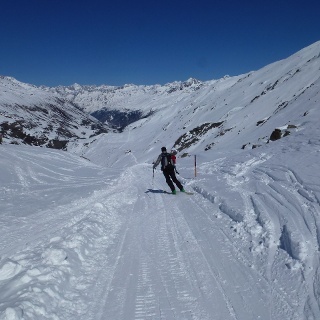 However, perfect snow and avalanche conditions must prevail in the northern flank. In addition, the danger of falling must be taken into account in the lower part of the flank which is up to 45 ° steep. Fatal accidents underpin this danger potential. But if the conditions allow, you will experience an impressive steep descent. The further descent over the Ferwallferner and subsequently through the Ferwalltal remains a never ending swinging experience.